sort of paranoid thriller, but all of them." A fair review, if not entirely playing according to Hoyle's rules, might go like this: it wears its ultra-cheap budget on its gore flecked sleeve; the production design is sparse and wanting (it looks like the film's been shot at whatever available locations presented themselves); the acting – with one exception – is more wooden than the vertical subjects of a Cuprinol commercial; the horror make up is extremely silly and the gore overwrought and as realistic as beetroot juice; the patchwork camerawork seems to have been shot from a child's point of view and exhibits the same 'can't-sit-still' tics that stalk the airwaves and screens of its own future – odd when a tripod was almost certainly used in most scenes. After all, this movie was made in 1979 but looks remarkably like it's been infected by a future-virus of shaky-cam. The editing is palpably frames off with continuity laying bleeding in its ham fisted wake but then you have to fold in a few mitigating circumstances. Editing kit in 1979 was essentially a light bulb, a couple of reel handles, some sticky tape and a pair of scissors; the crew had no prior film-making experience and finally this unremarkable but undeniably cute zombie flick accompanies the end credits of its parent movie, Super 8. You should stay the course and watch it. It's enormously sweet and slams you back to a time when you used to do the same thing. You did, didn't you? Didn't we all? Super 8mm cine film? It was the lifeblood of my teenage years, one sprocket at a time. Well, after I made a case that Harry Potter may have been the last time Hollywood makes mainstream movies showcasing a single author's voice, along comes Mr. Abrams to prove that there's life in the Summer big hitters, yet even if he is vicariously channelling the voice of his producer, Mr. Steven Spielberg. Super 8 is a modest gem in the Summer slurry and shines brightest at its more intimate moments. The key to the movie is the undeniably superb casting. Yes, there's a 'monster' in it, yes, Spielberg's the exec (sentiment alert) and there's a good 'jump out of your seat' shock every twenty minutes or so but in its large and forgiving heart (forgive it for not being a Michael Bay picture), Super 8 is a boy meets girl movie and it's all the better for it. Just before adolescence claims our leading rag-tag group of amateur filmmakers, we watch them as they stand on the highest ledge of innocence with further to fall into the fug of adolescence. Abrams has attempted, mostly successfully, to bottle the indefinable. His movie is a charm filled paean to what it felt like to live in 1979 as a misunderstood but wonder-filled child. 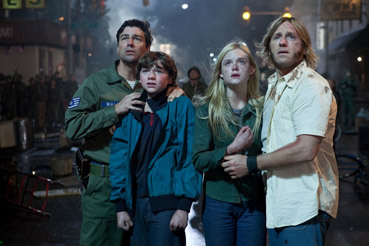 Of course, Super 8 was going to be Hollywood's only summer offering that would provoke my antennae to quiver. At the age of 18, I was still experiencing the delirious highs of Spielberg's Close Encounters (that movie took me a long time to get over and I'm not convinced I'm over it to this day). Super 8 invokes the era with such love and attention to detail that each scene had an aspect that would have captivated me, homesick, underground monster or no homesick, underground monster. Despite appearing like the raison d'etre of the movie (the well kept secret of a new CG creature alarmingly too much like the other monsters JJ has played with over the years in Cloverfield and Star Trek), this is the element that commercially insures the movie as it slyly slips a tender romance through the mammalian arachnid's legs. The central performance of Joel Courtney (Joe Lamb) is an absolute treasure. When we first see him mourning at his mother's funeral, he has the look, the hairstyle and the body language that anchors him in time and space. You fleetingly wonder how he could exist in the year 2011 – that's how perfect he is for this role. Even without the gentle exception of the poor sod that had to perform over and beyond some pretty dramatic teeth braces, each of the mini film crew is note perfect. There's a stand out scene that has real magic and for me it's the absolute highlight of the entire enterprise. Note that this has nothing to do with CG effects and is all about human beings. The crew prepare to shoot an encounter between a wife and a zombie-hunting hubby. Alice, played by Elle Fanning, delivers a drop-dead performance at a rehearsal (guys, always shoot the rehearsal!) while the boys look on stunned at her moving and faultless craft. She switches it off in a blink (reminding me immediately of This Happy Breed's Celia Johnson) saying "Is that what you want?" It's just wonderful and the looks on the boys' faces are priceless. It's odd how talent is always obvious to most of us and we stand in admiration. 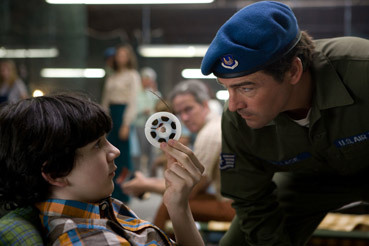 Thematically, Super 8 is essentially ET; alien gets boy's help (a boy from a broken family) to return home. It could be argued that the character of ET was a Christ metaphor (coming back from the dead, healing the sick etc.) but we'll have no such nonsense with our engine-raiding creature from the imagination of designer Neville Page. Abrams has learned enough from Spielberg. Less is more (despite this being foisted on Spielberg due to a malfunctioning shark) and Abrams wisely withholds any real full creature shots. The critter is rolled out one limb at a time and this is very effective and very satisfying even if it's an overused trope. It's only when it's required to emote (I believe there was performance capture employed) do we get lingering close ups, specifically picking out the change in its eyes. It's also lightning fast which helps to sell the numerous 'jump out of your seat' gags that punctuate the action. The only time you see the whole is in a necessary but belittling wide shot as it scuttles up a water tower. You have to remember that even Hans Rudi Giger's alien looked hokey in a wide shot. Ridley Scott came within a gnat's hair of spoiling all that came before with those rather unconvincing shots of the full size alien shot out of the airlock. But then again, narrative-wise, necessary is always necessary. Abrams has also managed to fold into his charming mix redemption for the town's bad seed (the heroine's father, of course), the making of the hero's own father initially lost without a wife crushed to death in a mill accident and a rather devastating sense of what it means to be human when the powers that be have a real, live ET to screw around with. Spielberg sent me out of the cinema in April 1978 looking up at the night sky muttering "I don't believe it..." Abrams managed (as I'm sure it wasn't his intention) to eject me out onto the street having confirmed that as a species, we really are quite dreadful. It's a key difference despite the benign actions of the kids. I guess that's a by-product of advancing years (my own) that cynicism is quick to the forefront of interpretation. But then what was the U.S. Army thinking?! "Hey, I have an idea. Let's torture and piss off an alien and call it research!" "Cool!" A lot has been written about Abrams' signature lens flare effects. I will add only this. When a lens flare – whether real or added in post – is calling attention to itself subverting the emotional connection to what's being presented on screen then it's time to stop signing your fecking canvas. Blue horizontal lens flares clutter the scene in the final shot – the moment when full emotional satisfaction should be reached. It annoyed the hell out of me to be forced to think "I really enjoyed this movie but why the hell am I now only thinking of lens flares?" Perhaps Abrams should consider a film about lens flares and get them out of his talented but flare-bound system. On the whole I would say that Super 8 is by far the classiest summer film out there with heart and soul although there are a few I've not caught yet. I mean how much can anyone look forward to a movie called Cowboys and Aliens knowing that the concept could not be higher (and James Bond and Indiana Jones are both in it). It'll have to be very good to nudge Abrams' love letter to Steven off the top spot. Go and wallow in some expertly crafted nostalgia.